Autopilot is a system of automatic controls which holds the aircraft on any selected magnetic heading. In this project our goal is to control the roll angle of the aircraft in the auto pilot system. The ailerons are important flight control surfaces present on aircraft. They are small hinged portion present on the outboard section of the wing. These surfaces are movable which control the motion of the longitudinal axis known as roll. They are used to produce the rolling movement for an aircraft. Actuator is the tool which aims the process to offer the output. 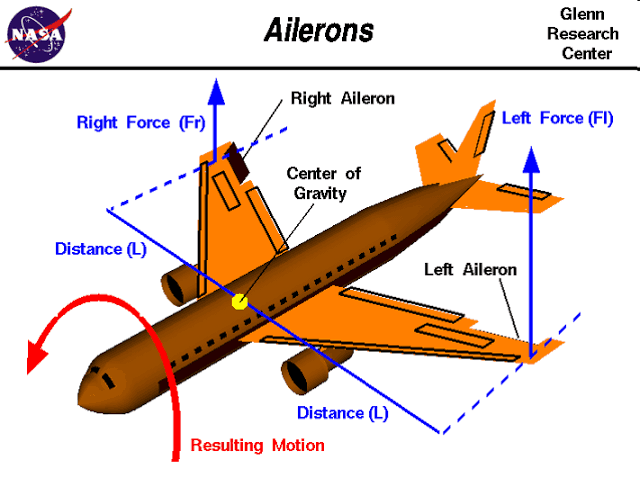 Hence the Aileron Actuator is the tool that forms the ailerons motions. The Gyro or heading indicator can be found in an aircraft to intimate the pilot where he is heading. It functions on gyroscope available with the aircraft horizontal. Flight dynamics is about the air and space science vehicle orientation which manages in three dimensions. The aircraft roll control consists of components and functions like controller gain, aileron actuator, aircraft dynamics, and gyro. The auto pilot system decreases the work burden of pilot. The pilot roll control removes the exhaustion to control the aircraft by the pilot. The system is used for auto missiles to manage the roll angle. It enables the aircraft for the control of auto pilot. On the trailing edge of the vertical stabilizer is the Rudder . This controls the yaw or the left/right sliding movements of the aircraft. On a real aircraft, this is controlled by the foot pedals. When the pilot pushes the left pedal, the rudder deflects left. Pushing the right pedal causes the rudder to deflect right. The elevator is on the tail of the aircraft, moving the elevator causes the nose of the aircraft to go up or down, allowing the aircraft to climb or descent.. Elevators control the up/down motion of aircraft that is called as pitch. When the pilot pulls the stick backward, the elevators go up. Pushing the stick forward causes the elevators to go down. The tail of the airplane has two types of small wings, called the horizontal and vertical stabilizers. A pilot uses these surfaces to control the direction of the plane. Both types of stabilizer are symmetrical airfoils, and both have large flaps to alter airflow. On the horizontal tail wing, these flaps are called elevators as they enable the plane to go up and down through the air. The flaps change the horizontal stabilizer’s angle of attack, and the resulting lift either raises the rear of the aircraft (pointing the nose down) or lowers it (pointing the nose skyward). Meanwhile, the vertical tail wing features a flap known as a rudder. Just like its nautical counterpart on a boat, this key part enables the plane to turn left or right and works along the same principle. Finally, we come to the ailerons, horizontal flaps located near the end of an airplane’s wings. These flaps allow one wing to generate more lift than the other, resulting in a rolling motion that allows the plane to bank left or right. Ailerons usually work in opposition. As the right aileron deflects upward, the left deflects downward, and vice versa. Some larger aircraft, such as airliners, also achieve this maneuver via deplorable plates called spoilers that raise up from the top center of the wing. By manipulating these varied wing flaps, a pilot maneuvers the aircraft through the sky. They represent the basics behind everything from a new pilot’s first flight to high-speed dogfights and supersonic, hemisphere-spanning jaunts. Aircraft is controlled with the help of three important surfaces. They are aileron, rudder, and elevator. The project is build for the purpose that allows the pilot to monitor the aircraft by all parts of flight. Auto pilot system reduce the work strain of pilot..
Auto pilot roll controlling reduces the fatigue of controlling the aircraft in flight by the pilot. It is used in the auto missiles to control the roll angle.. It can be used in almost every aircraft for auto pilot controlling..